Customized 2018 Kenworth T680 was sold at Ritchie Bros.' auction in Phoenix, AZ. Ritchie Bros. hitched its trailer to a very important cause in the month of June. 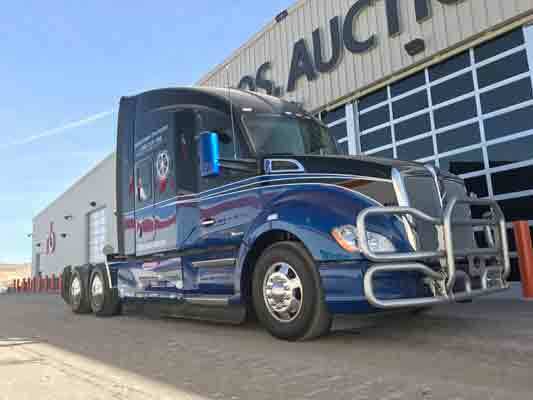 At its Phoenix, AZ auction on June 20, the company sold a customized 2018 Kenworth T680 truck tractor—donated by Inland Kenworth, one of the largest Kenworth truck dealers in North America, and a group of truck industry sponsors—and donated all proceeds to advocacy group Truckers Against Trafficking (TAT), to help prevent human trafficking. "When Inland Kenworth came to us with the idea, we jumped at the chance to do our part," said Chris Holmberg, Sales Director, Ritchie Bros. "We believe that with our global network of buyers we can get the best return for the Kenworth T680 and in turn help Truckers Against Trafficking. Ritchie Bros. is proud to support the prevention of human trafficking." Inland Kenworth has dubbed the special T680 the "Everyday Heroes" edition. The truck has a retail value of US$157,000 and features a 76-inch sleeper, 485 horsepower Paccar MX-13 engine and Eaton Fuller Advantage 10-speed automated transmission. "I first became involved with Truckers Against Trafficking after hearing a presentation they made at an Arizona Trucking Association conference," said Don Blake, Sales Manager at Inland Kenworth in Phoenix. "They opened my eyes to the evils of human trafficking. So many of the victims are innocent children. My heart hurt after being informed, but it made me want to help." Don continued, "We chose Ritchie Bros. to sell the truck because they are the best auctioneers in the trucking industry. I knew they would be willing to help. When I asked Chris Holmberg to auction the truck to benefit Truckers Against Trafficking, I couldn't even get the question out before he said yes. Not only has Ritchie Bros. offered to auction the truck for free, but they have worked very hard to market both the cause and the truck."